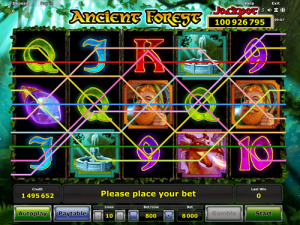 Ancient Forest is one of Novomatic’s newest jackpot video slots! It’s a totally enchanting slot game with beautiful graphics and huge potential wins. Any slots players out there who like fantasy movies or fantasy fiction will definitely have found their ultimate game with Ancient Forest. Just looking at the background will fill your head with imaginings of this magical forest! It’s dense and deep and green, and the sunlight is breaking through the canopy. The sun beams light up the magical sparkle in the air. Some trees can live for up to 5,000 years and there are definitely some ancient giants in this forest! You can tell by the size of their colossal trunks. Heaven knows what these ancient trees have seen throughout their lives. There’s one thing that’s for sure, though, and that is that they’ve seen some fantastical creatures! Living within this forest (and featuring on these reels) are dragons, elves and dwarves. Other symbols on these reels perhaps don’t live within these ancient trees, and these are traditional slot symbols which are high card values. The background of this slot game changes when you trigger the bonus feature. The bonus feature gives free games and multiplies all free spins wins. When you’re playing Ancient Forest, you can play manually or automatically. You can also gamble your wins if you wish, which gives you a 50% chance of doubling your win. The biggest win you can get in Ancient Forest is the jackpot! The massive jackpot is certainly what attracts most players to this Novomatic video slot. Opening this slot game in your desktop or mobile browser is like stepping into a magical wonderland. Greens and golds dominate the background and the logo, whereas bright colours dominate the reels. The different symbols are coloured dazzling shades of purple, blue, red, yellow and green. As with most Novomatic slot games, there are several symbols on the reels and all of them are worth different amounts in terms of wins. The more valuable a symbols is, the bigger wins it will pay out. The symbols that award the smallest wins are the card symbols, which reflect slot tradition! They’re always high values and in Ancient Forest, these are 9, 10, Jack, Queen, King and Ace. The symbols which award the bigger wins tend to be more intricate, picture symbols. In this fantastical slot, these high-paying picture symbols include: a magical gem, an ancient symbol, an enchanted wishing well, a red-headed dwarf, a fire-breathing dragon, a beautiful blond elf and an ancient tree. The more matching symbols you spin, the bigger the payout will be. Most symbols pay minimum wins with three matches, whereas others pay minimum wins for two matches (the card symbols and the dwarf symbols). Ancient Forest is a slot game that not only has a jackpot but also has a bonus feature! The majority of the wins you’ll get in Ancient Forest are in the normal game. If you get lucky and trigger the bonus feature, you’ll get the chance to win so much more! One of the great benefits of the bonus in Ancient Forest is that all your wins are multiplied by 2! So, any set of matching symbols that award a win – that win will be doubled! To trigger the bonus feature, you need to spin the reels and land 3, 4 or 5 Scatter symbols in one go. The Scatter symbol in this particular Novomatic slot is the ancient tree symbol. When you spin enough Scatters, you’ll be rewarded with 20 free spins! Every win you get during the Free Spins will be multiplied by 2 so you’ll get double the winnings. Ancient Forest has all the traits of an ordinary Novomatic slot. The music, the sounds, the design, gamble and autoplay. However, it does have one thing that only a select few Novomatic games have – and that’s a large jackpot! To win the jackpot sounds simple but it’s really not that easy! The jackpot is progressive, so it gets bigger and bigger until someone is lucky enough to win it! To get the jackpot, you need 5x elf symbols in one spin!